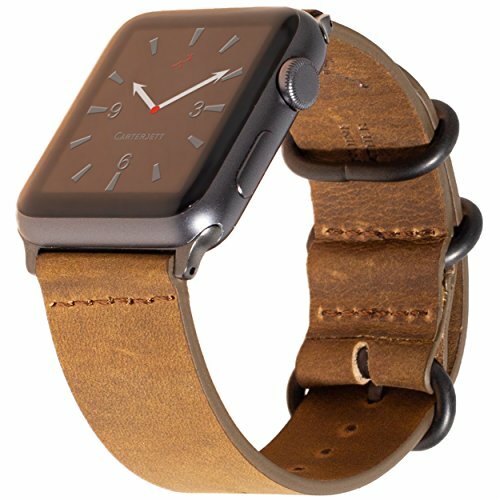 Carterjett original leather bands for Apple Watch are made to stand the test of time as well as to be fashionable and comfortable. Carterjett stainless steel metal adapters are custom plated and polished to match Apple colors and finishes. No screws in our adapters, so no tools required, no lost screws and no worrying about your Apple Watch falling! CARTERJETT CARRIES MULTIPLE LENGTHS TO FIT EVERY WRIST SIZE! Our unique Crazy Horse Leather NATO style has a distressed finish which changes with each use. The variations in color from coffee to carmel to beige are super retro cool! 100% SATISFACTION GUARANTEE; Carterjett offers high quality Apple iWatch replacement bands and accessories, USA based customer service with quick response times and hassle free returns and exchanges; Contact us if there is a problem and we will fix it! GREAT VALUE IN AN ORIGINAL DESIGN; Our military inspired NATO leather watch band is a hot fashion accessory for business, casual and dressy occasions. Get Apple quality at a fraction of the cost. Add To Cart Now!